Kelly D. Skinner, DNP, RN, NP-C, GNP-BC, CRRN, WCC, CFCN, currently serves as Membership Secretary of NOVA Chapter 226 where she also served as President, Secretary and Director. She is a member of the Academy of Spinal Cord Injury Professionals, Association of Rehabilitation Nurses, American Academy of Nurse Practitioners, American Nurses Association, and Sigma Theta Tau, Upsilon Lambda Chapter. Kelly is in her 29th year of continuous nursing service at the VA Boston Healthcare System. She started as a nursing assistant in 1989. Kelly obtained a Baccalaureate Degree in Nursing from Boston College in 1991 and a Master's Degree from the University of Massachusetts - Boston in 1999. She earned a Doctor of Nursing Practice Degree from MGH Institute of Health Professions in May 2018. Kelly is an Advanced Practice Nurse who is certified in rehabilitation, wound care, and foot care. She has been functioning as the Spinal Cord Injury Clinical Specialist at the VA Boston Healthcare System since 2001. Kelly states that one of her goals for NOVA is to "promote the image and professional status of VA nursing." She enjoys working with other VA nurses at the national level who support the advancement of nursing and strive to provide quality care to those Veterans who have served America. Ruth Holmes, MSA, BSN, RN, is a Clinical Program Manager and Nurse Investigator in the Office of the Medical Inspector (OMI) for the VA Central Office. In this role she ensures quality of care throughout the 153 VA Medical Centers and clinics throughout the nation, Puerto Rico, Hawaii and the Philippines. She has been in the nursing profession and federal sector for over 33 years, having a diverse clinical background with over 17 years of management, mentoring and varied leadership experiences. Ms. Holmes is a US Air Force Nurse Corps Officer and Veteran who served 8 years in various supervisory roles, to include: Charge Nurse, Nursing Supervisor and as a Flight Nurse overseas in the Philippines. She has been with the Veterans Health Administration for a total of 25 years. She worked at the Hampton VAMC (1987-2004) in several leadership positions to include: Nurse Manager of the Nursing Home Care Unit, Nurse Manager and Service Line Associated Chief SCI/D, and as the Director of Patient Care Services, SCI/D. She serves on several VACO and national workgroups and committees. Ms. Holmes received her Bachelors of Science Degree in Nursing from Seton Hall University and her Master’s of Science in Health Administration Degree from Central Michigan University. She is an Adjunct Clinical Nursing instructor at the Hampton University School of Nursing, New Horizon’s Technical Institute, and is a member of Sigma Theta Tau International Nursing Honor Society. She has completed multiple VA and DOD leadership programs: 2003 Leadership, Evaluation and Assessment Program; 2003 Executive Career Field Candidacy Program; 2004 LVA; 2006 Interagency Institute of Federal Healthcare Executives, and the 2007 Federal Executive Institute for Executive Nurses. In 2008, she participated as a nurse leader in the prestigious American Organization of Nurse Executives (AONE) co-sponsored, People to People Nurse Executive Delegation to South Africa. In this role, she was part of a one on one dialogue with African counterparts specializing in nursing administration. Ms. Holmes is also a Carey Award Examiner, a Presidential Management Fellow mentor, and preceptor to a VISN 6 LDI selectee. In addition, she serves as an unofficial mentor to several VHA leaders including Associate Directors, Nurse Managers, Nurse Practitioners and Heath System Specialists. She is an active member of the American College of Health Care Executives. She has been certified in Gerontology and Nursing Administration. Ms. Holmes has been a member of NOVA for 4 years and serves as Secretary/Treasurer on the NOVA Board of Directors. Ronald Nardi, MSN, PMHCNS-BC, APRN, completed his undergraduate education at Tunxis Community College and Central Connecticut State University in Connecticut with a focus in Psychology and Philosophy. He transferred to Vanderbilt University School of Nursing Bridge Program in Nashville Tennessee where he earned his Masters of Science in Adult Psychiatric Mental Health Nursing in 1991. He is ANCC Certified as a Clinical Nurse Specialist and became an Advanced Practice Registered Nurse in 1993. Since that time he has worked in a variety of psychiatric settings and roles across the continuum of care including inpatient, outpatient, teaching graduate and undergraduate students, as well as conducting Phase III and IV clinical research medication trials. He has directed inpatient adult and adolescent services as well as intensive outpatient services for 16+ years. Nurse Nardi has been with the Newington Connecticut VA for the past 15 years where he currently works as an APRN in the Mental Health Clinic on the PTSD Team and Adjunct Faculty for DNP Nursing Program of Fairfield University. Mr. Nardi is classically trained in Cognitive Behavioral Therapy having trained with Albert Ellis, PhD, at the Albert Ellis Institute in New York. He is certified in performing Prolonged Exposure Therapy for treatment of Posttraumatic Stress Disorder, certified in Motivational Interviewing for enhancing and strengthening motivation and Certified in Parent Effectiveness Training. Nurse Nardi has developed a 12-week Intensive Group Based Exposure Therapy for the treatment of severe Posttraumatic Stress Disorder. Ronald has presented and lectured to a wide audience base across the country and settings on a variety of topics and subject matter including the Assessment and Treatment of Schizophrenia, Bipolar Disorder, Posttraumatic Stress Disorder, Active Listening, De-Escalation, Cognitive Behavioral Therapy, Group Based Exposure Therapy and Forgiveness. Ronald Nardi is a member of ANA, CNA and NOVA. He is currently serving as Co-Leaded of the VA Connecticut APRN group. He is an active member of the Nursing Recruitment and Retention Committee. It is his goal over the coming years to help strengthen NOVA membership and engagement from all nurses, especially APRNs. He is excited to work with current and past leaders of NOVA to support legislation and actions to remove restrictions on Advanced Practice Nursing Nationwide. Locally, he is working with other NOVA members and nurses to re-establish the NOVA Chapter in Connecticut. Sharon A Johnson MSN,RN graduated from the Pennsylvania State University University Park Pennsylvania in 1974. She received her MSN in June 1996 from Bowie State University and was certified in medical surgical nursing for many years . She recently retired from the VA Maryland Health Care system after 31 and 1/2 years of service to our Veterans. Her career in the VA started as a head nurse and ended as the Acting Deputy Chief Nurse Executive for the VA Maryland Health Care system. During that time she held various management and clinical positions. Additionally during her career she taught nursing in the Baltimore City School System has been a Community Health Nurse and participated in research at Johns Hopkins University. She has mentored many during her 40 + years of Nursing and will continue to serve NOVA as a Nurse Emeritus. Teresa Acosta, DNP, MSN, RN, is currently the Occupational Health Nurse for the El Paso VA Health Care System, overseeing the management of the health and wellness for all employees, staff and volunteers . She has been a nurse for 25 years. She joined the VA system in 2010, and brings diverse nursing experiences comprising of public health, community, psychiatric, quality, infection control and ambulatory care nursing. Teresa is a graduate of Texas Tech University, Lubbock, TX, where she obtained a Doctorate in Nursing Practice in Nursing Administration. She has a Masters Degree in Community Health Nursing and a Bachelor Degree in Nursing and Spanish from the University of Texas, El Paso, Texas. Teresa Acosta is passionate about nursing and understands the significance of the nurse’s role in advocating for nurses, the nursing profession, and quality health care for all in today’s complex health care system. Teresa Acosta has been an active NOVA member since 2012. Teresa was appointed to the NOVA Legislative Committee in 2012. She joined NOVA’s Board of Directors in 2015. She is also a member of the American Nurses Association, for which NOVA is a proud Organizational Affiliate, as well as a member of the Texas Nurses Association District 1 and Sigma Theta Tau. She is also the current Secretary of the Texas Nurses Association District 1 and a member of the Texas Nurses Association Governmental Affairs Committee for District 1. Ms. Acosta is also an instructor in Nursing at the University of Texas, El Paso, for the undergraduate nursing program. TJ Wilcox-Olson, MHS, RN, has been a NOVA member since 2010 and previously sat on the Board of Directors as Director and Membership Secretary. She is a member of NOVA’s Annual Meeting Planning, Membership (co-chair), Social Media (chair), and Legislative Committees. Ms. Wilcox-Olson is the Patient Safety Manager for VA Portland Health Care System. She began her nursing career as a pediatric nurse with a goal throughout nursing school to work at the VA. She was offered and accepted a position at VA Black Hills in January 2008 and began her VA nursing career in mental health on an acute care inpatient unit. In 2011, she became the Patient Safety Manager there and held that position until March 2018 when she transferred to VA Portland Health Care System. Ms. Wilcox-Olson appreciates being able to work with her peers from across the country to improve quality care for our Veterans wherever they choose to be seen. 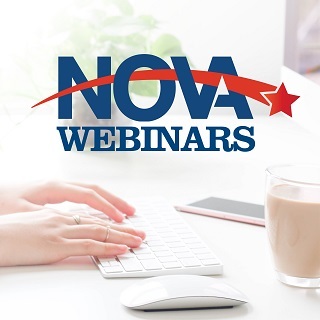 She believes NOVA is a vital part of building a large supportive, understanding, resourceful network of nurses who are skilled to care for the Veteran population. Catherine R. Giasson, DNP, MHA, RN, NE-BC, is the Chief of Employee Education at the VA Boston Healthcare System. She has been employed there since 1988 and has worked in a variety of settings including medicine, chronic and acute psychiatry and previously served in the role of nurse manager. As the Chief of Employee Education, Catherine is responsible for the education of over 4,800 employees as well as the professional development of over 1,000 registered nurses. She is also a clinical instructor for MGH Institute of Health Professions in Boston, MA. Catherine currently serves as Vice President of local NOVA Chapter 226 where she has served on the board as a Director. Catherine is also a member of several other professional nursing organizations including the American Organization of Nurse Executives (AONE), American Nurses Association (ANA), and Sigma Theta Tau International. Catherine obtained her bachelor’s degree at the University of Massachusetts Dartmouth and a dual master’s degree in Nursing and Health Administration from the University of Phoenix. She completed her Doctor of Nursing Practice for Nurse Executives degree at MGH Institute of Health Professions in May 2018. Ernestine L. Goode, MSA, BSN, RN, CRRN, CBIS, is currently the Chief Nurse for Spinal Cord Injury & Disorders/Polytrauma at the Hunter Holmes McGuire VA Medical Center in Richmond, Virginia. She received her Master’s Degree of Science in Administration from Central Michigan University, Mt. Pleasant Michigan in December 2002. She received her BSN Degree from Old Dominion University, Norfolk, Virginia in December 2000. She received her Nursing Diploma in December 1993, from Southside Regional Medical Center, Petersburg, Virginia. Prior to her professional career as a RN, Ernestine was a LPN for many years. Ernestine began her career at Hunter Holmes McGuire VA Medical Center in December, 1987 where she has 30 years of continued service. She has held many roles since her tenure which encompasses outpatient and inpatient services, LPN, Staff Nurse, Critical Care Nurse, Case Manager, Nurse Manager. She holds an ANCC Certification in Rehabilitation (CRRN) Nursing and a VA recognized Certified Brain Injury Specialist (CBIS). She is a graduate of the 2011 VISN 6 Leadership Development Institute. Ernestine has been a member of NOVA Chapter 420 for many years and she currently serves on the Chapter’s local Board. She is a member of ANA, ARN and Sigma Theta Tau. She is looking forward to working with the NOVA Board Directors to support the image and advancement of nursing, as well as advocate for the best quality of care for our Veterans. Theresa Presley MSN, RN, CNL, CCRN is currently the Associate Chief Nurse Specialty and Outpatient Clinics at the VA Boston Health Care System. In this role Ms. Presley is responsible for administrative functions of the acute outpatient division of the VA Boston Healthcare System. She functions as a leader, educator, and consultant utilizing systems management theory in collaboration with numerous clinical and administrative services. Theresa started her VA nursing career 29 years ago as an LPN at VA Boston Healthcare system. In 1992 she received her Associates Degree in Nursing from Quincy College. She returned for her Bachelor’s Degree in Nursing from Curry College in 2008, A Master’s Degree in Nursing with a Clinical Nurse Leader Certification in 2012. Theresa is a certified Clinical Nurse Leader in the state of Massachusetts; she also holds certification in Adult Critical Care. Ms. Presley has served on the local NOVA board chapter 226. She currently serves as the secretary. She is a member of Sigma Theta Tau International, the Clinical Nurse Leader Association. During the past 27 years Ms. Presley has provided a full range of nursing care to acute and critically-ill medical and cardiac patients. She began a management career in Cardiac Critical care 2009. In 2015 she was appointed as the Associate Chief Nurse of specialty and outpatient clinics. She has completed has the VA Management Leadership Development Program as well as the Advanced Leadership Academy. She is a certified mentor, serves on the board of directors for Massasoit Community College. Michelle Salazar, RN has been with Black Hills Health Care Veterans Affairs since 2012. She began as an emergency department nurse and is now a case manager for Care in the Community, formerly known as Non VA Care. She was a “late in life” nurse and prior to working for the VA, she worked for Regional Health in the local hospital as well as the main campus in the emergency department. She had the opportunity to be a travel nurse in the Denver, Colorado area as well. Michelle has been a very active member of her local NOVA chapter and has been awarded NOVA’s Professional Nurse Award for Clinical Excellence in 2016 due to her efforts and passion advocating for our veterans navigating through the Choice Act. She is a very active member of the NOVA Legislative Committee, social media committee and the chapter contact for her local chapter. “I am so honored to be a member of such a great organization. I have been received with open arms and allowed to step out of my shell and for my voice to be heard in honor of all Veterans I care for." Cecilia McVey, MHA, RN, FAAN, has held progressively responsible leadership positions within VA Nursing Service since beginning her career in 1972. In 1997, she was appointed as Chief, Nursing Service for the former Boston VA Medical Center. Upon the merger of that entity with the West Roxbury division in 1999, she was named Chief, Nursing Service for Integration and subsequently Associate Director for Nursing/Patient Services (ADN/PS) for Boston and West Roxbury. When the Brockton division was reintegrated in June 2000, Mrs. McVey was appointed to her current role of ADN/PS for the entire Boston Healthcare System. In this role, she is accountable for the delivery of nursing care throughout the BHS and the management of nearly 1000 employees at the three main divisions as well as satellite facilities. As a member of the BHS Leadership QUADRAD, she contributes to policy development and decision-making and participates in strategic planning and resource management. Mrs. McVey received her Bachelor of Science in Nursing from Boston College in 1972, completed a certificate program in Nursing Administration at Clark University in Worcester in 1986, and received her Master of Science in Health Administration from Clark in 1988. She has published several articles in professional journals, and remains certified in Nursing Administration by the American Nurses Association. Her professional memberships include Sigma Theta Tau (National Honor Society of Nursing), the Massachusetts/Rhode Island Association of Registered Nurses, Organization of Nursing Leaders - Massachusetts/Rhode Island, former Vice President of the Nurses Organization of Veterans Affairs Foundation, the Boston College Nurses Association and the Nurses Organization of Veterans Affairs (NOVA), for which she was the National Past President 2008 - 2010. Mrs. McVey currently serves as Co-Chair of the Nurse of the Future Core Competency Committee and was recently appointed to the Commission on Collegiate Nursing Education (CCNE) Standards Committee. Kristy Cohen serves as Executive Director of NOVA. Kristy is responsible for operational oversight of the association including strategic initiatives, budgeting, program development and committee management. Kristy has over 20 years of experience in the non-profit world with a background in fundraising, non-profit management, strategic planning, financial management and volunteer recruitment. Kristy is passionate about her role in working with NOVA’s board and volunteer leaders to deliver high quality programs and benefits to support members’ success. Kristy’s background includes a Political Science degree from Appalachian State University along with Dale Carnegie Management Training and the NLI Fellow Leadership Institute program with the Community Foundation of New Jersey. Kristy is an avid baseball mom who lives in Cherry Hill, NJ with her husband David and their three boys; Gabe (15), Ben (13) and Zach (11).